Scrapito, cards with the effects of stained glass. With Scrapito, using contour stickers and coloured Scrapito foil, you make gorgeous decorations for cards. The result is super beautiful and it is super easy to do it! Remove a protective layer from a piece of adhesive foil and put a sticker on it. On top of the sticker you put a piece of coloured Scrapito foil, which you rub firmly onto the sticker with a Scrapito fingertip and in the corners with a Scrapito precision pen. Then you pull off the piece of coloured foil and, here we are, the sticker has been coloured in beautifully! Cut out the sticker and put it on a transparent card. The result is spectacular and comparable to a piece from a stained glass window. All Scrapito products are available separately but also as a complete package. 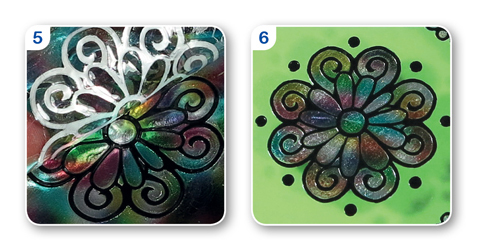 You can make gorgeous cards with the Scrapito products, resulting in a kind of stained-glass effect. What you need: black contour sticker, transparent double-sided adhesive foil, Scrapito foil, Scrapito pad, Scrapito finger tip, Scrapito precision pen. Step 1. Cut out a piece of double-sided adhesive foil that is somewhat larger than the sticker you want to use. Good to know: Each packet of Scrapito foil includes a sheet of double-sided adhesive foil. Step 2. Remove one of the protective layers from the adhesive foil and put the contour sticker onto the adhesive foil. Put this combination on the Scrapito pad. Tip: If you have a large sticker, proceed as follows: put the protective layer you removed from the foil on the table with the smooth side up and put the sticker on it with the adhesive side up. Check that the sticker is level and then put the adhesive foil on the sticker. This prevents a large sticker from becoming crumbled when being stuck. Step 3. Take a piece of Scrapito foil and put it over the sticker, ensuring that the coloured side is up. Step 4. Press the Scrapito foil firmly using the Scrapito finger tip. Then use the Scrapito precision pen to get the Scrapito foil also in the corners and small parts of the sticker. Good to know: The Scrapito pad is thick and solid. Another type of pad will be too soft and you will get through it easily. If you do not use a pad you will make scratches more easily. Step 5. Remove the Scrapito foil and cut out the picture all round. Good to know: The adhesive layer of the double-sided adhesive foil remains adhesive for as long as no Scrapito foil has been put onto it. If there are still any bare spots, you may simply put back the Scrapito and repeat the above steps on the spots where this is needed. Step 6. Remove the second protective layer from the double/sided adhesive foil and stick the composition on the front of a (transparent) card. Decorate the cared with corners and edges. You can also use Scrapito for decorating glass objects or non-transparent cards and objects. The black contour stickers combined with the shining Scrapito foil always produce a special and exclusive effect.